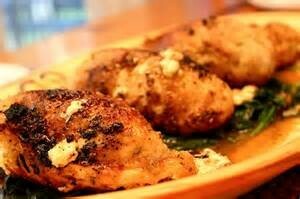 Recipes - Entrees - PARMESAN CHICKEN SAUTE - Salado Olive Oil Co.
Wash chicken and let dry or dry with a paper towel. Pound chicken between plastic wrap till flat. Put chicken pieces into a large bowl. Place cheese in a bowl and put beaten eggs in another bowl. Dip each piece of chicken first into the beaten egg mixture and make sure that they are coated well. Sprinkle the salt and pepper on each piece then roll in the parmesan cheese. In a large skillet, heat the olive oil and place the chicken pieces in the hot oil and saute. Turn the chicken pieces when brown and brown on the other side. Lower the temperature to ensure that the chicken does not burn. Cook the chicken till done. You can place some that are done in a preheated 300 degree oven while you are sauteing the rest of the chicken. If you need more oil to cook add slowly. Chicken should register 165 degrees to make sure it is done through. This should take you about hour to cook all the chicken and when it is cooking, you can be preparing a delicious garden salad using Salado Olive Oil Co. 25 Year Traditional Balsamic for the dressing.